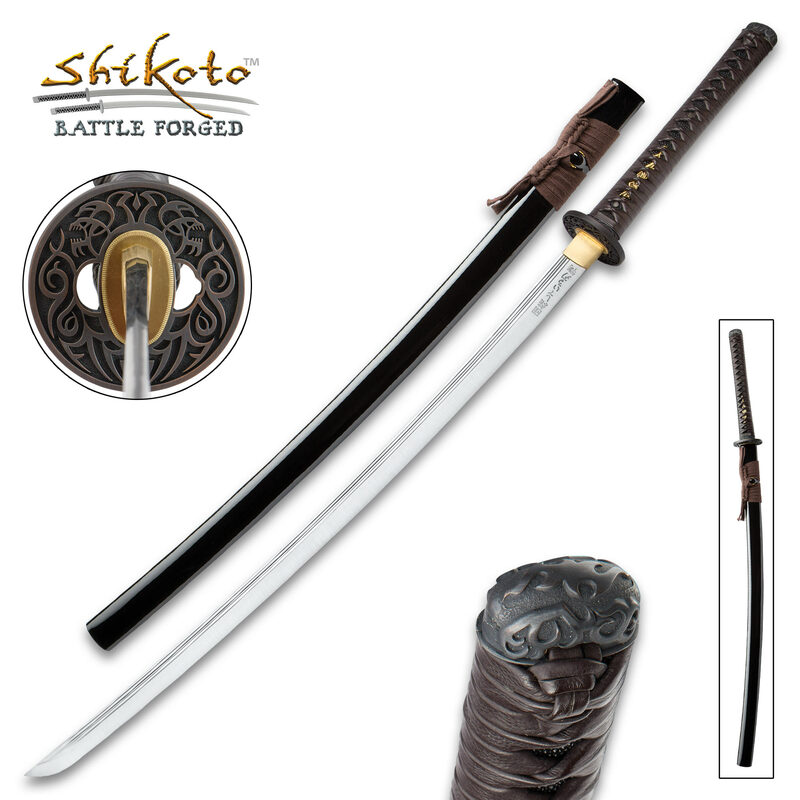 Shikoto Shikyo Handmade Katana / Samurai Sword - Hand Forged 1045 Carbon Steel; Engraved Bushido Code Kanji, Twin Fullers - Iron Tsuba, Genuine Ray Skin, Leather - Functional, Battle Ready, Full Tang | BUDK.com - Knives & Swords At The Lowest Prices! Stamped blade kanji translate to ""rectitude, courage, benevolence, respect, honesty, honor and loyalty" - the "Seven Virtues" of the Bushido Code. Shikoto's “Shikyo" Katana is both savagely beautiful and beautifully savage - a rare fusion of exquisite visual allure and raw power. It bears the hallmarks of swords priced orders of magnitude higher - expert design, precision engineering, quality steel, distinctive appointments and more. But the Shikyo needn't be - nay, can't be - compared to any other sword, as it boasts features you won't find anywhere else, as well as a wielding experience and charm all its own. 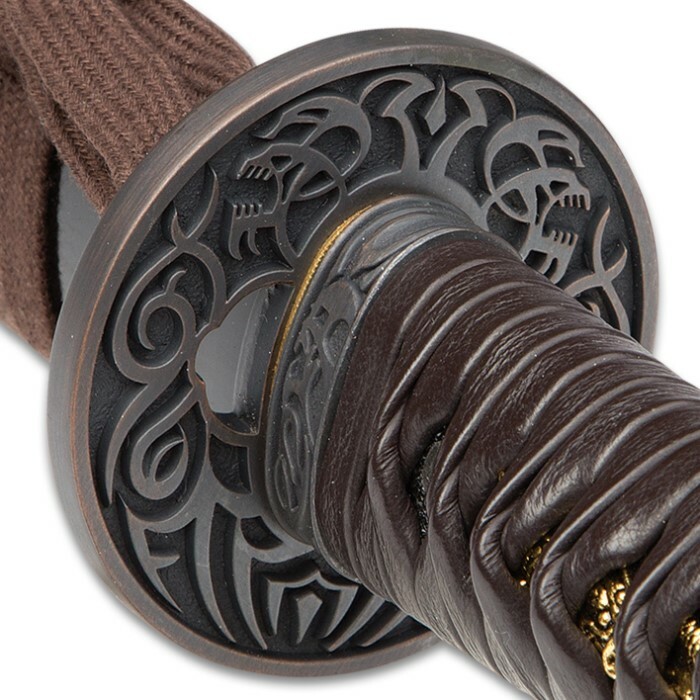 It's a veritable swordcraft goldmine, never ceasing to yield rich sword-wielding experiences from the moment you first grasp the rustic leather-bound tsuka to your inaugural cut and every time you brandish it beyond. The heart, soul and teeth of the Shikyo is its formidable tanto blade. Shikoto's master smiths diligently hand forge each one from premium 1045 high carbon steel, using many of the same ingenious, time honored techniques and the same painstaking attention to detail employed by their ancient forebears. Making a Shikyo blade is a slow, laborious process, but examine this steel masterwork closely or - better still, experience it in action - and you'll agree it's well worth the extra time and effort. With its exquisite finishing accents, however, a glance is all it takes to realize the Shikyo blade is truly special - set apart from all other blades, even the most expensive. Seven Bushido virtues. Only one Shikyo. Distinctive kanji are engraved just below the habaki, translating to "rectitude, courage, benevolence, respect, honesty, honor and loyalty." These represent the "Seven Virtues" of the Bushido Code. Twin fullers run along the spine, adding a sense of class and visual charm. 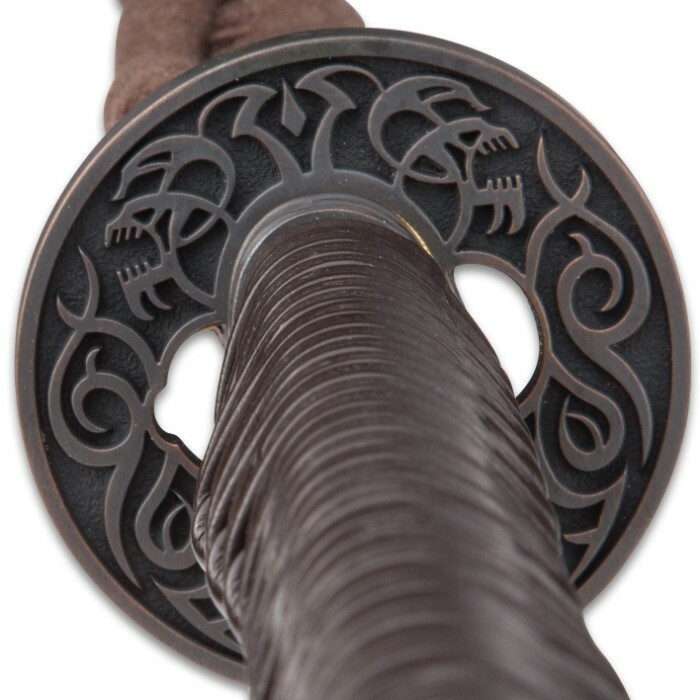 Just as 16th century Japanese swordsmiths marked their blade tangs with a unique signature, the Shikyo blade's tang bears an identifying insignia exclusive to Shikoto blades - ensuring authenticity and exacting quality standards. It's a stately finishing touch, but you don't need any mark to assure you of the Shikyo’s potency and quality; experience it for yourself, and you’ll know beyond a shadow of doubt. 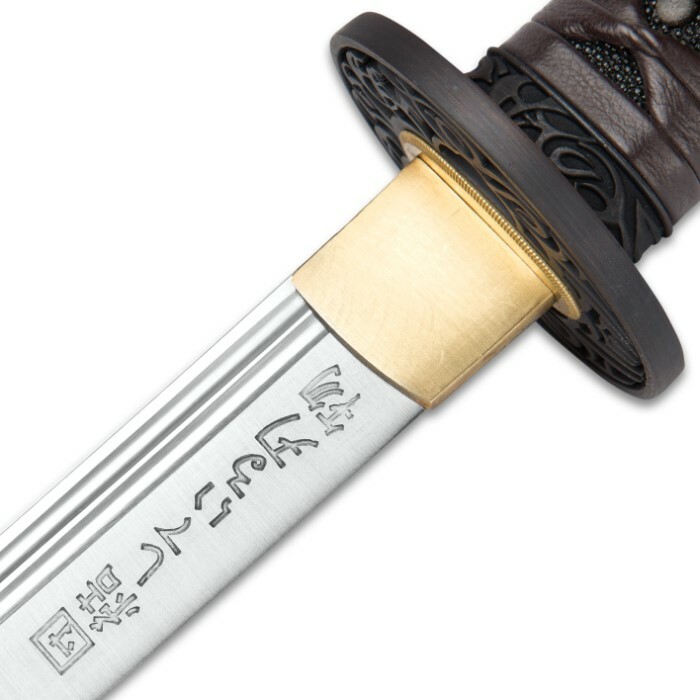 Developed with the serious swordsman in mind, the Shikyo slices cleanly and effortlessly through rolled tatami mats, thick bamboo and other tameshigi. Shinwa’s exceptional tempering truly proves its worth in trials like these, as it allows the Shikyo to retain its carefully honed, razor sharp edge through even extended cutting sessions. Furthermore, the Shikyo’s weight is shrewdly distributed to maximize swinging momentum and power, blow after devastating blow. This impeccable balance also improves control and responsiveness, allowing for greater agility and flexibility in combat. The delicately textured genuine ray skin same and distinctive leather ito that cloak the tsuka afford a comfortable, no-slip grip that not only furthers the Shikyo’s superb feel; it also enhances its distinctive visual appeal, as well. Leather affords an intriguing contrast to the fabric cord that typically encircles traditional tsukas. Flawlessly cast from iron like Katana of ages past, the tsuba and kashira both sublimely offset the rustic leather. 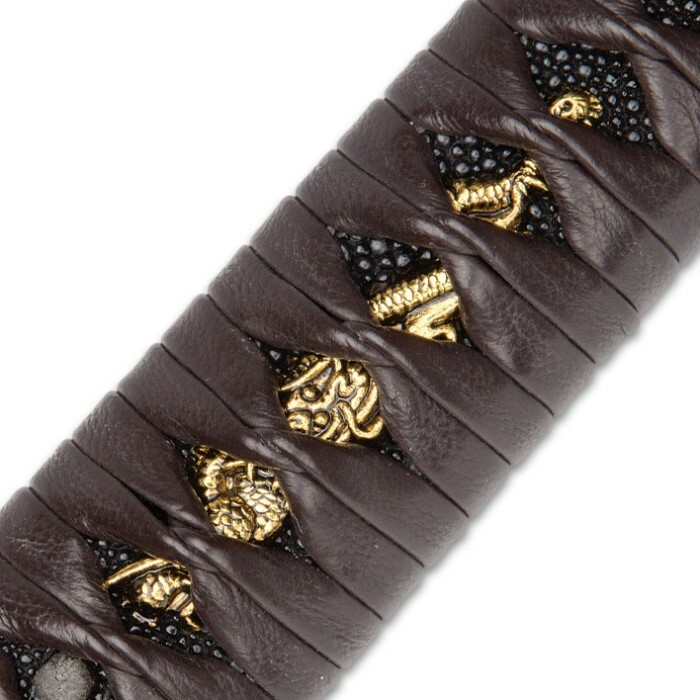 Both are embellished with wicked-chic reliefs comprised of sleek, interlocking lines and other eye-catching patterns. A classic brass menuki is nestled between leather ito and ray skin same - a gleaming counterpoint to the matte iron and hushed hues that make up the tsuka. The Shikyo has proven itself time and again, and it holds its own against any of today's most expensive Katana, outperforming many. But the old cliché is true - "action" does indeed "speak louder than words," and at this unbeatable, downright unheard-of price, why deny yourself the opportunity to experience Shikoto's Shikyo Katana for yourself? No matter how you use it, with proper care you can enjoy it for a lifetime, then pass it down to your children, grandchildren or great-grandchildren! This heirloom-quality masterwork is built to be treasured by generations of your descendants - your legacy preserved in hand forged steel. Awesome Sword of the month. Unbelievable sword. Beautiful detail and the handle wrap is perfect. Keep up the good work Bud K.
I received this as a gift. The sword came as advertised. It was not damaged and the packaging was good. It came sharp and lightly oiled. The blade is well balanced and it "moves" well during use. Very good for the price and quality. Would buy again and from this company. Aside from a hiccup in the quality of the original one I ordered, this is a fantastic sword. The first Shikyo budk sent me had a couple nicks in the leather wrap and the hardwood tsuka was cracked/separated along the bonding portion of the two halves which made it unsafe for use and resulted in a creaking sound when wielded. Budk sent me a replacement at no cost within about 7 days. The replacement shikyo is solid. Fantastic quality for a Chinese made sword and very, very sharp. This sword IS useable, but I do recommend only soft targets to avoid scratching or dinging the polished surface. Great buy. I'm very pleased with the cost/quality. This is not built like a cheap replica. It's the real deal. There's no need for a Harmon on these because the quality of the steel is superior to the traditionally welded and folded cakes of raw material full of slag. This sword is awesome! Great feel to it. The leather cord wrapping feels very comfortable in the hand. The blade is razor sharp and the balance is great too. I'm very very pleased with this sword! If anyone is skeptical in buying I'll tell you it's a great sword for the price. Definitely don't pass this one up! I have bought many swords over the years, this one is one of the very best, strong and sharp out of the box, this sword could last a hundred years fine detail. I have been a customer of BudK for years and this last purchase was well worth it. Besides getting The Dark Dragon Katana on BOGO I have been wondering what this sword would be like. I am very satisfied with the 1045 high carbon blade. The handle is awesome. Its wooden underleather and ray skin, not wrapped in nylon. This is my first sword that is not a Shinwa.This is my first blade from Shokoto and any person into swords will love this UNITED CUTLERY steel. Blade nicely sharp and has a small bit of flex. Perfect 29 & 1/2" mirror polished blade is made extremely well made. Cant say enough about it. The only thing I personally dislike is the CHINA stamp on the spine near the handle. 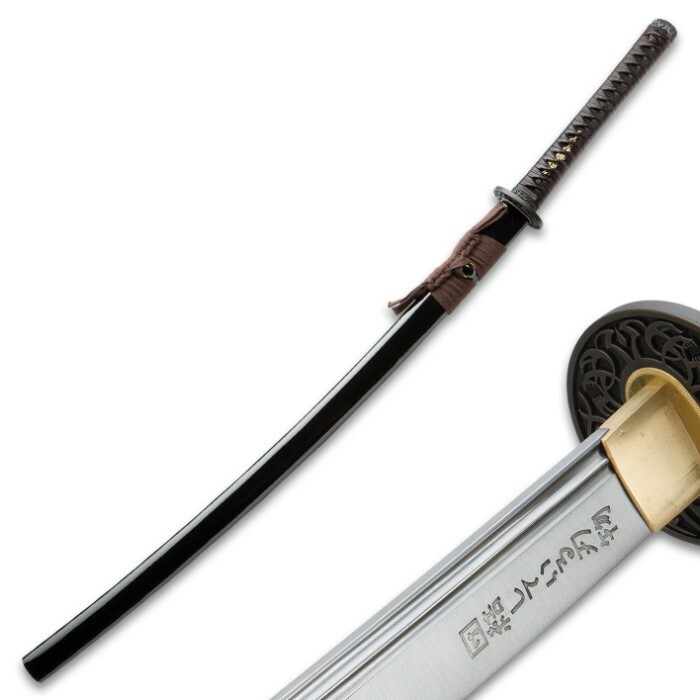 Its already stamped "Handcrafted in China" already some minor sharpening and polishing this sword it really impressiv ! Definitely a good sword. Highly recommend !!! I bought 7 swords and this one and the Shinwa Teal Katana are the best out of them all. Really cool thing is they are curved nicely. 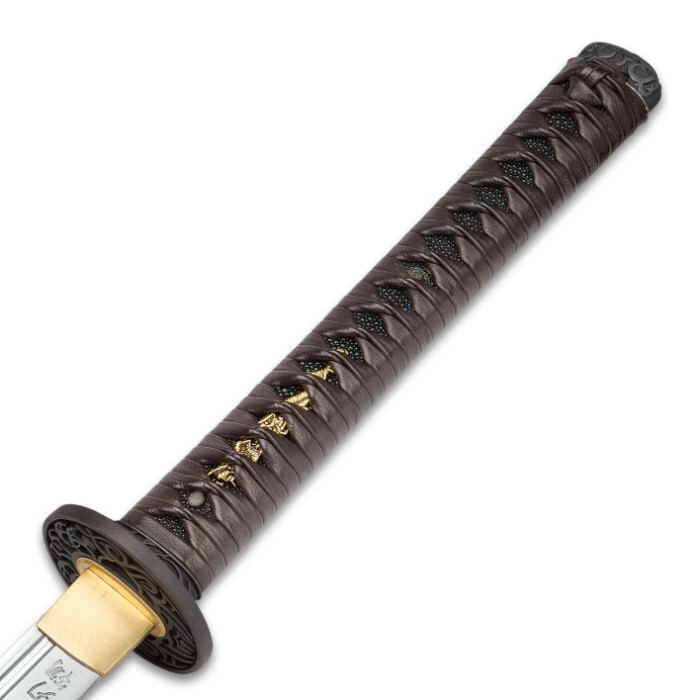 Just got this sword in the mail now, and the Habaki (Blade Collar) was loose, you could hear it clicking agianst the blade, over all this is a nice sword, but it needs to be inspected before shipping out. i was able to tighten the habaki, but still would rather have had not to, anyway i will give this a 4.5 due to loose parts. Fantastic work . Thanks for the artisans of united cultery for crafting this beautiful work of art. Keep your blades true and people will be true to you.